Originally thought to be available only to the world’s wealthiest nations, genomic medicine has developed into a broad range of clinical methods and technologies whose concrete applications are also revolutionizing health systems in many of the world’s resource-limited nations. 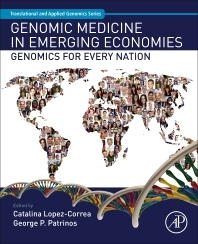 Genomic Medicine in Emerging Economies: Genomics for Every Nation provides in-depth analysis and key examples of the implementation of medical genomics in low-income nations across the globe, demonstrating how this advancing medical science has already transformed health systems and led to improved patient care in Indonesian, Chilean, Malaysian, Argentinian, Chinese, Sri Lankan, and Colombian populations among others. In addition to defining tools, diagnostics, and treatment pathways at the population-wide level for medical geneticists, genomic researchers, and public health workers to apply in their own work, this book offers an essential, case-study based approach needed to understand how genomic medicine can be used to improve disease-management in a diverse range of economic and social contexts. Dr. Catalina Lopez-Correa is Vice-President and CSO of Genome British Columbia, an organization that leads genomic innovation in British Columbia and facilitates the integration of genomics into society. She has more than 18 years of experience in the field of genomics, particularly in the use of genomic technologies to ensure economic and social impact in resource-limited nations, and the implementation of genomic technologies into health care systems. She has participated in several international initiatives on the implementation of genomics and is scientific advisor to the company BioGenomas which offers genetic testing services in Colombia. Since 2002, Dr. Lopez-Correa has also served as evaluator for large multinational projects funded by the European Commission, the IMI (Innovative Medicines Initiatives) and the NIH and has been recognized by several awards nationally and internationally. As part of her commitment to international development, Dr. Lopez-Correa funded the not-for-profit organization ODNS (Organisation pour le Développement avec des Nouvelles Solidarités) in 2012 and has been involved in several initiatives aimed at demonstrating the impact of genomics in developing countries. Dr. Lopez-Correa has published 9 scientific papers in peer reviewed journals on topics ranging from human genomics to genomic medicine implementation and molecular pathology.